Taxis are available from the Paphos Aiport and take about 45 minutes to get to Coral Bay. You can hire a car and drive yourself, the road is simple and well signposted though a GPS will of course make it easier. Driving in Cyprus is on the left as in the UK so no problem for British people though perhaps confusing if you are travelling from elsewhere in the world. Although taxis are of course the most convenient and fastest route from the airport to Coral Bay there are also public busses available which are airconditioned and of course much cheaper. 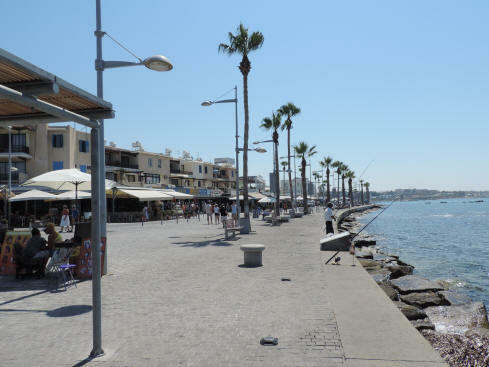 To go from the Paphos Airport first take bus Route 612 which leaves the airport regularly and goes to the main town of Paphos. This is about half an hour of riding on the bus. At the main bus stop in Paphos you can change to the Route 615 bus which is a similar bus that goes right to the Coral Bay bus stop in about 45 minutes. But why not stop in Paphos for a while? The main bus terminal is on the harbour front and has great views over the bay to the Castle of Paphos as well. The main Coral bay Avenue which leads from the beach inland is the center of most restaurants in the district, but remember that some of the best options are more off the beaten path so do explore the different parts of Coral Bay. Cypriot food is a mixture of different influences from the Mediterranean, and of course particularly in Coral Bay you will find many foods from the local seas. All types of seafood both familiar and exotic are available, together with steaks, salads and pasts. © Copyright 2013, coral-bay-cyprus.com, All Rights Reserved.